The Qualifier Plus IIIfx-DT is the ideal desktop real estate finance calculator for real estate investors and agents. In addition to both common and advanced real estate finance problems and complete buyer qualifying, it calculates multiple cash flows and internal rate of return (IRR), as well as net present and net future values (NPV/NFV) - all in a large, easy-to-use desktop format. Solve real estate finance and investment problems quickly and conveniently using the Qualifier Plus IIIFX-DT desktop real estate finance calculator from Calculated Industries. This large, desktop calculator is made specifically for real estate agents and investors and includes advanced functions to pre-qualify buyers, make tax and mortgage calculations, determine cash flows, and accomplish other related tasks. 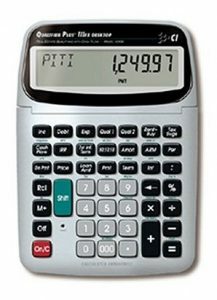 The Qualifier Plus includes a protective slide cover and also serves as a standard calculator. With the Qualifier Plus IIIFX-DT desktop real estate finance calculator, you can quickly qualify potential homebuyers, find the answers to common real estate finance and investment problems, and serve real estate clients in a fast, professional manner. This tool can calculate multiple cash flows and internal rates of return, along with net present and net future values, and it allows you to make a variety of advanced loan, payment, tax, insurance, and investment calculations. I love this calculator, I've been using this brand for over 9 years. I am a mortgage loan officer and it helps me calculate mortgages easily. The smaller one died after 8 years and I have an app on my cell phone but I like this one the best! I had used the hand-held Calculated Industries real estate finance calculator for years. I had to have the desk top when I first saw it, and it has even more features while retaining all the ones i needed and used in the past. My first real use of it was for a million dollar loan on a jet aircraft to enable my friend to enlarge his fleet. The figures I obtained were used to determine the payment plan for the purchaser in accordance with the the time period of the loan. Superb product which is invaluable for its intended uses. Not only is this a good calculator but, you have a very friendly and professional customer relations dept. I had to return some miss ordered product and they were very helpful. I've been using the same iiiFX Desktop model 43430 for over 13 years-DAILY! Great, quick calculations for loan scenarios. I tell everyone in the mortgage and real estate industry to get one! NEVER had to replace battery either! I see a lot of my elder colleagues still using the old HP mortgage calculators... Not sure why though - I solve payment, look at total interest, and even run a boomer payment scenario and they're still punching buttons to solve for payment... ANTIQUATED. Awesome Real Estate Finance Calculator for the Mortgage Banker's Desk. Customers appreciate the speed and large numbers calculated right in front of them. Only downside is that it is a little pricey, defaults to three decimal points (for rates), and doesn't work well for simple percentage calculations like LTV or DTI.